Yahoo: Pixelplus revenue for the third quarter of fiscal 2009 was 3.6 billion Korean won (US$3.0 million), compared to 4.4 billion Korean won (US$3.8 million) in the second quarter of fiscal 2009, and 4.5 billion Korean won (US$3.8 million) in the third quarter of fiscal 2008. 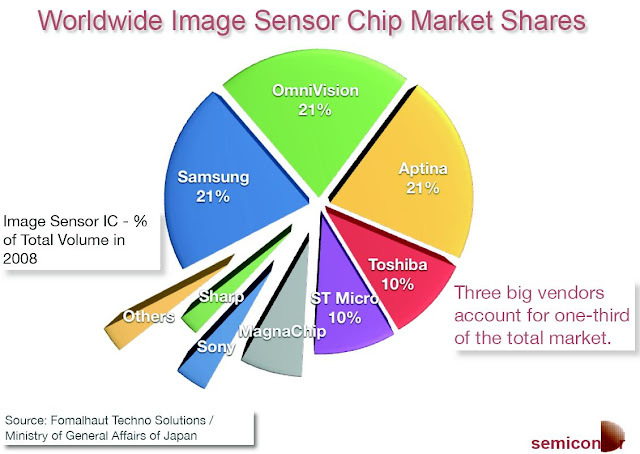 The Company sold roughly 2.5 million image sensors in the third quarter of 2009, which represented a decrease of about 2.2 million from its sale of around 4.7 million units in the second quarter of 2009. Gross margin for the third quarter of fiscal 2009 was 32.2%, compared to 21.0% in the second quarter of fiscal 2009. What is "Wonderbra Image Sensor"
Recently Caeleste also added a mirror site with .eu extension. Digitimes reports that STMicro plans to introduce low-cost 5MP AF and EDoF image sensors targeting high-end smartphones in Q1 or Q2 of 2010, according to the company. The AF driver is integrated on the sensor, saving $0.30 for an external driver for AF module - most of ST competitors so so as well. Most of ST CIS production has migrated to a 65nm process, and the company has begun 45nm tape-out, the company added. ST lost its market positions in 2008 due to lagging in 2- and 3-MP product development, according to Digitimes sources. The company has spent almost two years designing new products and advancing its manufacturing process to lower production costs in order to enter the low-cost handset market in 2010, the sources indicated. I-Micronews: French company Saint-Gobain has developed a new technology to manufacture arrays of gradient index planar lenses in glass at the wafer scale. The optical function of a gradient index lens is provided by the gradual distribution of the refractive index inside the glass. The resulting optical element is perfectly flat. This might be convenient for integrating several optical elements in the lens of wafer-scale cameras. At the current development stage, 1000 optical elements can be fabricated at 8" wafer. The goal is to reach 5000 gradient index lenses per 8" glass wafer in the near future. On November 16, 2009 e2v opened Centre for Electronic Imaging (CEI) at The Open University’s Milton Keynes campus. CEI is a collaboration between The Open University and e2v, providing knowledge exchange between the UK technology industry and the academic world. The collaboration will see The Open University and e2v investing £3m in the UK knowledge economy over five years in new research activity through the e2v CEI. ratio. This imager has been realized using two important technologies: the column ADC, and the back-illuminated structure. ...In the future, the performance of the digital camera is expected to improve tremendously with the evolution of the CMOS image sensor. There are many “key milestones” in this evolution, such as “3D”, “4K×2K”, “global shutter”, and so on. Electrons and Holes blog referred to an interesting paper from the open-access Sensors magazine discussing the issue of non-linearity in dual-integration HDR mode. This non-linearity is often omitted from the HDR principle explanation, although it can greatly affect the final image quality. The non-linearity is caused by two factors, namely the current diffusion, which has an exponential relation with the potential barrier, and the initial condition of photodiodes in which it shows that the error in the high illumination region increases as the ratio of the long to the short accumulation time raises. Moreover, the increment of the saturation level of photodiodes also increases the error in the high illumination region. To make the analysis more complete, I'd like to see the influence of pixel to pixel mismatches on this non-linearity and see whether these mismatches make the non-linearity less visible in the final picture. The paper relies on Link Research' SPECTRA simulator - a good demo of the simulator capabilities. ISSCC published its Advance 2010 Program with 9-paper session devoted entirely to image sensors. All papers appear quite interesting this year. A 1/2.3-inch 10.3Mpixel 50frame/s CMOS image sensor fabricated using a 0.13μm 1P4M CMOS process with back-illumination technology achieves sensitivity of 9890e-/lux·s, random noise of 1.7e- and saturation of 8850e-. The sensor integrates a 10b/12b analog-to-digital converter, an internal PLL and a 10b serial LVDS interface to enable a data-rate up to 576MHz. A 2.2/3-Inch 4K2K dual resolution and exposure CMOS imager uses motion information to improve the sensitivity by 4 times in comparison to a conventional sensor. The green pixels are read out once every four frames for high sensitivity. Both the red and blue pixels are read out each frame, binned for 2×2 and used for motion compensation. A CMOS image sensor for spatial optical communication is presented. A two-transistor optical communication cell with a depleted photodiode and lateral charge overflow drain improves the light pulse response. A weighed summation of 9-point parallel analog outputs and pulse equalizing technique greatly enhance the bit-rate and communication distance up to 10Mb/s and 70m, respectively. A 2.1Mpixel 120frame/s CMOS image sensor with column-parallel ΔΣ ADCs is realized in a 0.13μm CMOS process. Column-parallel ΔΣ ADC architectures improve the conversion speed while reducing the random noise level as well. Inverter-based SC circuits maximize the power efficiency. This sensor achieves a measured noise floor of 1.9e-, while dissipating 180mW. A pseudo-multiple sampling technique for a low-noise CIS is implemented using a conventional column-parallel single-slope ADC structure with no additional circuitry. It is applied to a 1/3.2-inch 8Mpixel CIS. Measurement results show the technique effectively reduces dark temporal noise from 1.6e- to 1.2e- in 10b ADC mode, and from 1.8e- to 1.1e- in 12b ADC mode. A dual global shutter CIS with pinned storage diode and floating diffusion memory enables a low noise level of 2.7e- and wide dynamic range of 92dB. Dual doping pinned diodes with a shielding structure attain a high shutter efficiency of 99.7%. A 0.18μm CIS contains a QVGA array of autonomous pixels that individually detect illumination changes and communicate new gray levels that are PWM encoded after each detected change, ideally realizing optimal lossless pixel-level video compression. Readout is frame-free 18b parallel AER. SNR of >56dB and intra-scene DRs of 143dB static and 125dB at 30fps equivalent have been achieved. Digitimes reports that Aptina and OmniVision are expected to enjoy growing orders from Japan during 2010, as Japanese camera makers enhancing their hybrid camera offering. Mainly 14MP sensors are to be used in these hybrid cameras. It's not clear why Digitimes has not included Samsung 14MP product in its speculations. Digitimes reports that Mediatek adopts EDoF-enabled sensors for its Chinese-market 3G handset IC solutions since the first half of 2009. EDoF image sensors are expected to become more popular in the global handset market in 2010 because EDoF module prices are about US$3 lower than AF modules, according to Digitimes' sources. Digitimes sources think that EDoF image sensors will be the first choice for cameraphones with 3MP or higher resolutions in the future, and 8MP cameraphones will become the mainstream in 2-3 years from now. Albert Theuwissen published his impressions from November's IEEE Transactions on Electron Devices Special Issue on Image Sensors, along with memories from the previous special issues. Yahoo: The Frost & Sullivan '2009 European Real-Time 3D Imaging Enabling Technology Innovation Award' is presented to PMDTechnologies GmbH (PMDTec). "Photonic mixer device (PMD) technology developed by PMDTechnologies GmbH has opened up opportunities to develop three-dimensional imaging devices that are low cost, complex and robust," notes Frost & Sullivan. IFM Electronics GmbH, specializing in the industrial automation sensing, has included in its product offerings the 3D camera developed in cooperation with PMDTechnologies and provides this solution to about 80,000 customers worldwide. In co-operation with Audi and Volkswagen, PMDTechnologies is already in the pre-fabrication stage of 3D sensors for automotive applications. Moreover, with other partners, the company is also developing solutions for medical, security & surveillance, and gaming application areas. Currently, PMDTechnologies is working on 0.18-micron CMOS technology integration. Such an approach would lead to the creation of even smaller 3D imaging devices which could be available at lower cost. The company envisions such a camera for below $30 soon. Such performance at this price point has not been achieved using other 3D approaches, e.g. fringe projection based 3D vision systems, so far [Questionable claim - ISW]. Digitimes quotes Aptina CEO David Orton saying that Aptina plans to use Micron's 8-inch fab in Japan as its image sensor production site due to too many short lead-time orders from clients. Monthly capacity at the 8-inch fab in Japan is about 40,000 wafers, about the same as its 8-inch fab in Italy. The two 8-inch fabs will migrate to a 90nm process in the future, said Orton. Greg Helton, president and managing director of Aptina Japan, noted that building closer relationships with customers is one of the reasons for using the fab in Japan since customers Canon, Nikon, Sony and Panasonic are all Japan-based. Aptina will also consider using fabs in Taiwan for manufacturing some of its CIS products in the future, Orton added. Live Technologies, the company behind LiveLens idea, has manufactured an 1MP prototype sensor on X-FAB. Then the liquid crystal assembly was done at Liquid Crystal Institute Advanced Materials Department, Kent State University, Ohio. Now the company demos WDR imaging results on its web site. The company has US patent 5,953,082 on its technology. Yahoo: Silicon Frontline Technology, an EDA company in the post-layout verification market, announced today that Aptina is using Silicon Frontline's F3D (Fast 3D) software for post-layout verification and for fast 3D extraction to improve Aptina's image sensor design accuracy and manufacturing quality. By using Silicon Frontline's F3D software, Aptina's designers are optimizing floating diffusion capacitance, inter-pixel coupling, color-filter effects, impact of metal fill and signal channel mismatch. Want to Earn $50 for Your Image Sensor Knowledge? Electronic Design Magazine conducts Image Sensor Quiz, sponsored by Toshiba. All the participants are eligible to win one of six $50 Amazon certificate, so hurry up! Thanks to N. E. for letting me know. Military and Aerospace Electronics: Raytheon Vision Systems is licensing the Ziptronix direct bond interconnect (DBI) technology in focal plane array technology for air, space and terrestrial image sensor applications. Ziptronix DBI technology provides 3D integration of multilayer CMOS structures within the focal plane. Yahoo: Pixim announced that major security equipment manufacturers Cisco, GE Security, Siemens Building Technologies, Rainbow, Clinton Electronics, deView, Wren, Digimerge and Innotech are adding new Pixim-powered cameras to their line up. Digitimes reports that Omnivision lost VGA sensor slot in HP low-priced notebooks to Hynix and SETi. This appears to be the first publicly announced high-profile design wins for the two Korean companies. They won by undercutting Omnivision's price, according to Digitimes' sources. Samsung also won Asustek design slots over Omnivision, based on lower pricing. However, Samsung sensors are reported to be in short supply, so Asustek got back to Omnivision. Lower pricing could help Omnivision to regain lost design slots, according to Digitimes. Yahoo: Retired Kodak research scientist Bryce Bayer, whose invention of a color filter array enabled digital imaging sensors to capture color, is honored by the Royal Photographic Society with its Progress Award at a ceremony in London. Bayer invented the color filter array that bears his name (the Bayer filter), which is incorporated into nearly every digital camera and camera phone on the market today. Described in U.S. Patent 3,971,065, “Color Imaging Array,” filed in 1975, color filters are arranged in a checkerboard pattern to best match how people perceive images, and provide a highly detailed color image. Sony announced 2.5um pixel based fast frame rate sensor family for industrial applications. The new 3.27MP 1/2.8-inch IMX036LQR/LLR CMOS sensor family has color and B&W sensor versions. Sony uses “Exmor” brand for them which is a name for CMOS sensor with high-speed processing, low noise and low power column-parallel A/D conversion. The sensors provide HD Video in 1080p format at 60fps speed at 10b ADC resolution or 30fps at 12b. At full 3.27MP resolution mode the sensors deliver 60fps rate at 10b or 15fps at 12b. 2x2 and 3x3 addition modes are supported. No power consumption number is given. Le Figaro (in French) reported that e2v announced its intention to eliminate 221 jobs, or nearly 50% of its workforce at its site in Saint-Egrève, near Grenoble. Bought in 2006 from Atmel, San Egrève site manufactures semiconductors for medical imaging, equipment and aircraft and employs 462 people. "The activity of semiconductors remains strong but we have suffered several setbacks including the dental medical imaging," the HR Director Philippe Fourcade Prat said. According to the union CFE-CGC and CFDT, the layoffs are mainly affecting the technicians of the company. The planned layoffs and restructuring information has been circulating for few weeks already. UK Business Weekly reported that in the last 12 months, in particular since December 2008, e2v has seen a progressive weakening in demand across some of its commercial and industrial market sectors and in its medical market sector. Sales for the six months ended 30 September 2009 was down on the previous year at £96m (H1 2008/9: £107m) and pretax profit dropped to £2.6m (H1 2008/9: £3.1m). e2v, which has some 1,700 staff, has already reduced headcount by over 130 staff in the last six months, reduced hours in the UK and USA, extended summer closure of the facility in Grenoble, France and closed its long range ‘Biosensors’ program in June 2009, just 10 months after its relaunch. Having also decided to suspend its acquisition program and not pay an interim dividend for the 2009/10 year, e2v will also completely restructure its French operation and close down its Lincoln, UK manufacturing site. In Grenoble, France, the company intends to refocus the operations associated with the imaging devices division around a fabless CMOS business model, complementing activity to the CCD-focused imaging operations in the UK. In Lincoln, UK, where e2v has 160 employees, the company will close manufacturing activities and consolidate them at other UK sites, though the company says it is eager to keep key engineering and design jobs going and may create an engineering center in the city. Further restructuring may also take place at its Chelmsford, UK headquarters. Thanks to T.B. for the information! "Advances in a CMOS Image Sensor based miniature fluorsence Detection System for Biosensing Applications"
"State-of-the-art and future perspectives of Back-Side Illumination"
"Pixel Architectures for Time-Resolved Imaging Applications"
"A 32x32 Parallel Time-correlated Single Photon Counting Array in 130nm CMOS Technology"
Thanks to A.T. for sending me the info. In this paper we present a CMOS image sensor technology suitable for the next generation of scientific cameras. We describe a 5.5Mpixel device based on this technology. The sensor features 5T pixels with pinned photodiodes on a 6.5um pitch. Each pixel also includes an integrated micro-lens. The 5T pixel architecture enables both rolling and global shutter operation. The measured peak quantum efficiency of the sensor is greater than 60% at 550nm, and the read noise is less than 1.5e- RMS at room temperature. The linear full well capacity is greater than 35ke-, the dark current is less than 3.8pA/cm2 at 20°C, and the MTF at 77 lp/mm is 0.4 at 600nm. The sensor also achieves an intra-scene linear dynamic range of greater than 87dB (23000:1) at room temperature. This sensor has on-chip dual column level amplifiers and 11 bit single slope analog to digital converters (ADC) for high speed readout and wide optical dynamic range. The dual column level amplifier/ADC pairs have independent gain settings, and the final image is reconstructed by combining pixel readings from both the high and low gain readout channels to achieve a wide intra-scene dynamic range. The bandwidths of the column level amplifiers are programmable to optimize the sensor read noise for the selected sensor frame rate. The sensor can be readout in either rolling shutter or global shutter mode. The sensor can operate up to a line rate of 9us or a frame rate of 100Hz. The high speed digital readout electronics allow pixels to be scanned out at up to 290MHz. Image sensors can benefit from 3D IC fabrication methods because photodetectors and electronic circuits may be fabricated using significantly different processes. When fabricating the tier that contains the photodetectors, it is desirable to avoid pixel level patterning of the light sensitive semiconductor. But without a physical border between adjacent photodetectors, lateral currents may flow between neighboring devices, which is called ''crosstalk''. These currents degrade the image quality because photo-generated charge carriers are sometimes collected in the ''wrong'' pixels. In this work, we present a method to reduce crosstalk in unpatterned photodetectors for vertically-integrated (VI) CMOS image sensors. Through feedback control of the electric potential at vertical interconnects, the crosstalk becomes negligible under normal imaging conditions. By maintaining a vertical electric field throughout the photodetector of sufficient uniformity and magnitude, lateral currents due to drift and diffusion are buried in the read noise. We illustrate the general method using the specific example of a VI-CMOS image sensor fabricated by flip-chip bonding a glass die with photodetectors to a CMOS die with active pixel sensor (APS) circuits. We present a logarithmic APS design with feedback control, which can be used to maintain an appropriate and suitably constant potential at the flip chip bonds. Simulation results are shown for a 0.18um CMOS process. Our group has been developing a new type of image sensor overlaid with three organic photoconductive films, which are individually sensitive to only one of the primary color components (blue (B), green (G), or red (R) light), with the aim of developing a compact, high resolution color camera without the color separation optical systems used in current color cameras. In this paper, we firstly revealed the unique characteristics of organic photoconductive films. Only choosing organic materials can tune photoconductive properties of the film, especially excellent wavelength selectivities which are good enough to divide the incident light into three primary colors. High-resolution of the organic photoconductive film sufficient for high-definition TV was also confirmed by shooting experiment using a camera tube. Secondly, as a step toward our goal, we fabricated a stacked organic image sensor with G- and R-sensitive organic photoconductive films, each of which had a readout circuit of zinc oxide (ZnO)- thin film transistor (TFT), and demonstrated the image pickup at a TV frame rate. A color image with a resolution corresponding to the pixel number of ZnO-TFT was obtained from the stacked image sensor, clearly indicating that color separation can be achieved using vertically stacked organic films. Recently, we have proposed a new image device called gigavision camera whose most important characteristic is that pixels have binary response. The response function of a gigavision sensor is non-linear and similar to a logarithmic function, which makes the camera suitable for high dynamic range imaging. One important parameter in the gigavision camera is the threshold for generating binary pixels. Threshold T relates to the number of photo-electrons necessary for the pixel output to switch from "0" to "1". In this paper, a theoretical analysis of the influence of threshold in the gigavision camera is studied. If the threshold in the gigavision sensor is large, there will be a "dead zone" in the response function of a gigavision sensor. A method of adding artificial light is proposed to solve the "dead zone" problem. Through theoretical analysis and experimental results based on synthesized images, we show that for high light intensity, the gigavision camera with a large threshold and added light works better than one with unity threshold. Experimental results with a prototype camera based on a single photon avalanche diodes (SPAD) camera are also shown. Yahoo: I3A (International Imaging Industry Association) announced the winners of its new awards program, the VISION 2020 Imaging Innovation Awards. Tessera won the Silver Award for its demonstrator of a wireless “smart” camera module in a toy. The demonstrator includes a VGA wafer-level camera that integrates the company’s wafer-level optics and image sensor packaging, face and smile detection technologies. Combined, these technologies enable the toy to detect multiple faces and provide appropriate responses, from making happy sounds when a new face appears, to laughing when a face smiles. Dexela introduces a family of large area flat panel CMOS X-ray detectors based on an innovative CMOS sensor design that combines fast speed and superior image quality. The Dexela detector family’s main components are: CMOS image sensor, scintillator (structured CsI or Gadox), control electronics, readout electronics and communications with the workstation. The Dexela CMOS image sensor consists of a photodiode array with a pixel size of 75µm. The sensor has very low dark current and read noise, with high linearity and consistency of response. A range of models is offered with the model number based on the active area: 1207 (115mm x 65mm), 1512 (145mm x 115mm), 2315 (230mm x 145mm), 2321 (230mm x 210mm), 2923 (290mm x 230mm), and 2923MAM (290mm x 230mm). The detector is capable of multi-resolution readout with dynamically adjustable binning at 1x2, 2x2, 1x4, 2x4 and 4x4. For the largest model in the range, the frame rate ranges from 26fps at full resolution (75µm) to 86fps binned 4x4 (300µm pixel pitch) over the whole active area of 29cm x 23cm. The high fill factor, efficiency and low noise of the sensor combine to produce a high DQE of 0.70 at a skin dose of only 280µGy. This results in lower patient dose and said to be superior in image quality when compared to TFT-based detectors with significantly lower DQE. Previously Dexela told that its X-ray image sensors are the largest commercially avaliable ones and are composed of tiled CMOS dice. Yahoo: Aptina launched MT9F001 - 14MP, 1.4um-pixel based sensor. The new sensor is able to capture 1080p/60fps HD video using four-lane HiSPi (High Speed Serial Pixel Interface) serial data interface. Aptina A-Pix technology is claimed to overcome the challenge of effective photon collection in the photodiodes that small pixels present when using conventional FSI approach. The result achieved with Aptina’s technology is said to be BSI-equivalent in terms of sensitivity, but with less crosstalk for lower noise and more accurate color reproduction. There are few more Keith Fife papers on multi-aperture imaging published on Keith's Stanford University page. One of them is "Design and Characterization of Submicron CCDs in CMOS" paper and presentation slides on IISW 2009. Also, Keith's PhD Thesis "Devices for Integrated Multi-Aperture Imaging" from June 2009 is now on-line. Albert Theuwissen's excellent PTC tutorial now covers bloom and DC offset influence on PTC curve. Very nice reading! Pixim's Digital Pixel System Technology won Best All Digital Technology from GSN: Government Security News during the 1st Annual Homeland Security Awards Ceremony. Business Wire: Cypress announced three of its state-of-the-art CMOS Image Sensors for space applications are on-board the European Space Agency’s (ESA) Proba-2 Satellite, which was launched on November 2. Cypress’s new HAS2 image sensor, specially designed for high accuracy star tracking, is implemented on a new Star Tracker developed by SELEX Galileo of Italy. The HAS2 image sensor is also being used in an extreme-ultraviolet telescope scientific experiment for solar corona observation. Additionally, Cypress’s STAR-250 image sensor is used on a new Digital Sun Sensor developed by TNO of the Netherlands. Both the HAS2 and STAR-250 devices were developed for the ESA by Cypress’s Image Sensor Business Unit in Belgium. HAS2 image sensor has an array of 1024 x 1024 active pixels (18 µm) and supports on-chip Non-Destructive Readout and multiple windowing. STAR-250 sensor was originally developed for an optical inter satellite link. Currently it is mainly used for sun sensor applications. The device has an array of 512 x 512 pixels (25 µm). Yahoo: Cypress announced 1.3MP VITA 1300 sensor combining a pipelined and triggered global shutter with a frame rate of 150fps. The 1/2-inch sensor is based on 4.8um pixels. It has four 10-bit LVDS outputs with a programmable offset and gain amplifier for each channel of the LVDS outputs. Each channel runs at a 620Mbps. An alternative data output is available through a single 10-bit parallel CMOS data output, operating at 62Msps. Extended optical dynamic range can be achieved by setting multiple slopes. 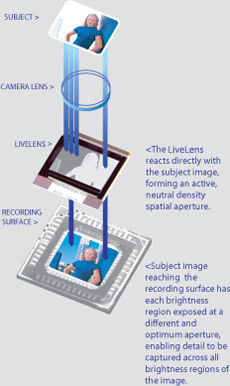 Samples of the VITA 1300 image sensor are expected to be available in February 2010, with production devices expected in the fourth quarter of 2010. FinanzNachrichten, Business Wire: Aptina announced MT9M033 surveillance image sensor combining wide dynamic range and HD. The new 1.2MP sensor is capable to run at 720p/60fps for HD video. There is no word on pixel size or any other pixel performance information. From the PR it's not clear how WDR mode is implemented. The MT9M033 is sampling this quarter. Production is in Q1 2010. Sharp announced that its CCD/CMOS sensors sales for the last 6 months ended on Sep. 30 have declined by 7.4% vs same period a year ago. However, the company is pretty optimistic about its yearly results, predicting 10.5% growth. The image sensor sales are expected to reach 90B Yen in its fiscal year ending on March 31, 2010 (see the bottom of the last page in the company report).